There are lots of different job positions in a library and I have worked my way through almost all of them: book shelver, circulation clerk, children’s library assistant, reference librarian, readers’ advisory librarian, programming librarian, and now director. No IT, no bookkeeping, no technical services and no office manager, but I am gaining great respect for the people who fill those jobs. I point out all the different jobs because you’ll notice that all but one work directly with the public all the time. Being director is quite different for me in that I have to make a concerted effort to see and talk with patrons, most of the time. Fortunately for me (because I miss it! 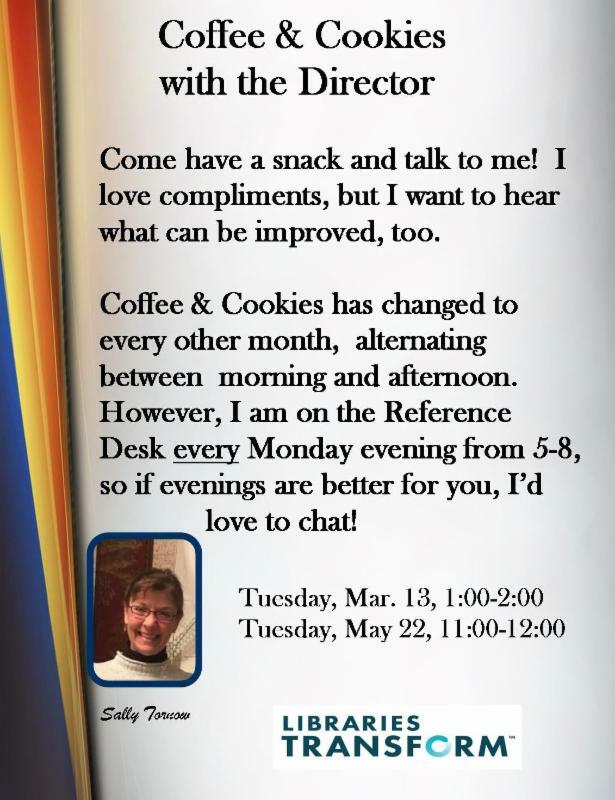 ), I still have assigned time on the reference desk, so the opportunity to interact one on one is still possible. This past weekend, I had the pleasure of helping two young mothers who actually had the same problem. Both were looking for downloadable ebooks for their children that had an audio capability. Many children can read more fluidly if the words are said aloud to them. They know the word verbally, but recognizing it in written format can be difficult. I assisted them with downloading the apps they needed to access our regular ebooks, but sent them to our wonderful staff in the Children’s Dept. to learn exactly what was available. What surprised me and why I am writing this, is that the mothers had no idea that we offer Tumblebooks, a read along online source. 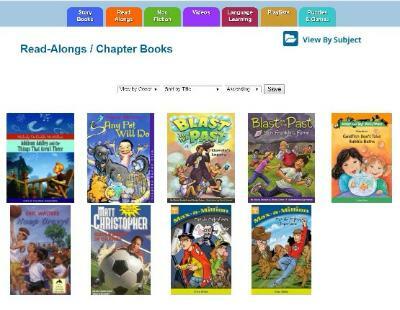 While most of the books offered are picture books, there are some chapter books available, too. We will also be adding more readalongs in our Axis360 ebook platform, so keep an eye on that. All of us need to be aware of what is available to help foster our children’s love of reading! 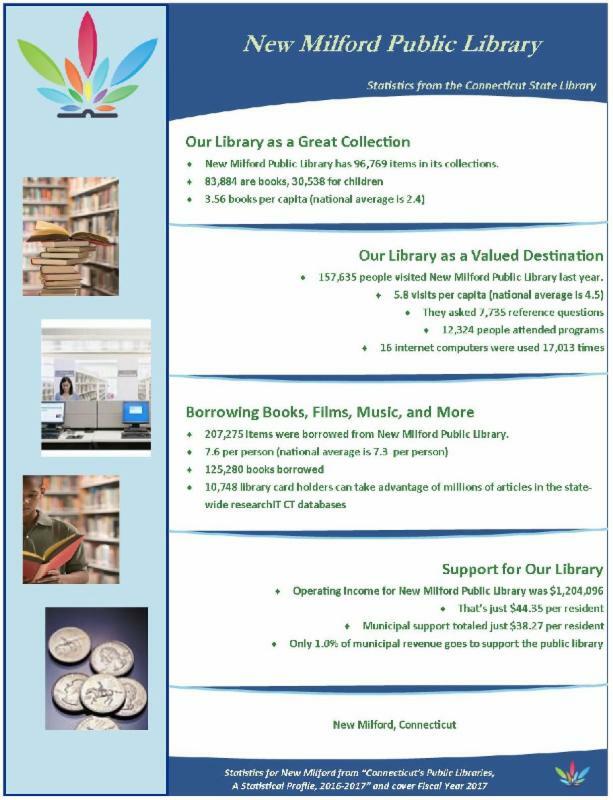 NMPL is YOUR library. We know that some of our offerings are more popular than others. We know that some programs are more popular than others. Our goal however, is to provide you with the things that you find most enjoyable or useful or informative. So to help us to do a better job of serving you, we ask that you please fill out this short (9 question) survey of your likes, dislikes and what you would like more of. Go to SURVEY. We are very anxious to hear all about your ideas. To supplement the survey, please feel free to email us your ideas and comments to stornow@biblio.org. Look How We Stack Up! The best thing about a public library is that it serves EVERYONE, young, old, rich, poor, male, female, etc. We also serve and work with many organizations. Over the past few years, the following local organizations have collaborated with us for informational programs or we have assisted them in pursuing their goals. New Milford Social Services Dept. This is an impressive list of very important organizations, but we would like to make it even more impressive. 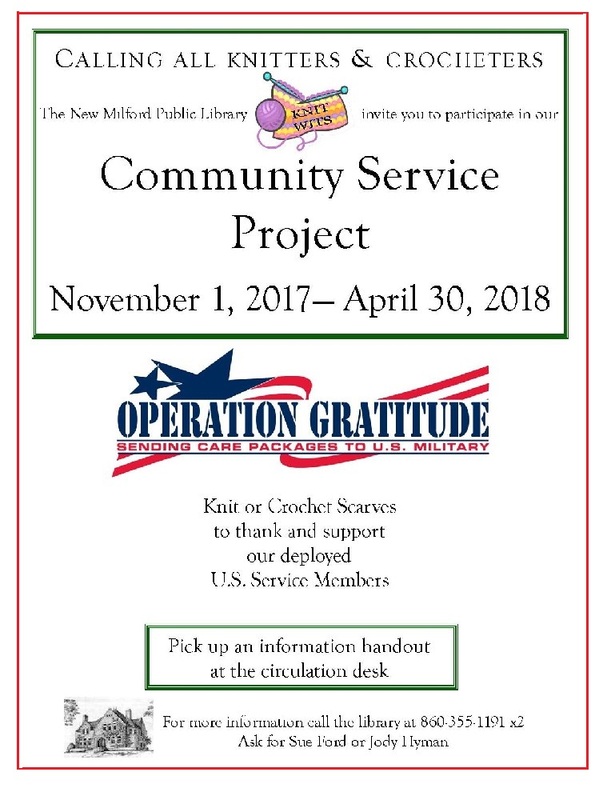 If you belong to a group that would like to offer a program at the library about what the organization does OR you would like me to come speak about how the library can assist your organization, please contact me at stornow@biblio.org or 860-355-1191 x210. I’ve Changed My Schedule for the New Year! We have the best FRIENDS-and Jen LaCava has volunteered with the NMPL’s Friends of the Library since 1998! Jen grew up in Franklin Lakes, NJ, the oldest of 10 kids, and so she loves to be helpful and around lots of people. She and her parents and siblings try to get together as often as they can. 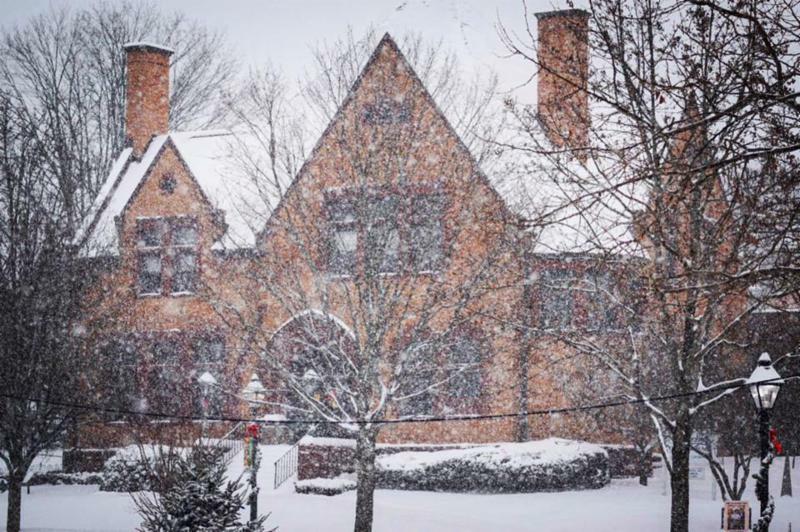 She went to Muhlenberg College in Allentown, PA, to get her education degree and met her husband Chris there. In 1998, the couple moved to New Milford; Chris is from Warren and wanted to help the family business. 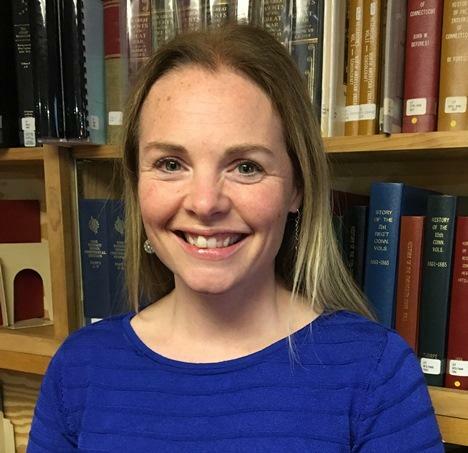 Jen immediately began volunteering at the library and then started her teaching job at New Milford High School in the fall of 1998. She worked there for several years and then took time off to stay home with their three children, Katie, now 15, Joey, now 13, and Zachary, now 11. She returned to teaching in 2013. Jen loves teaching and is glad she lives in New Milford. She enjoys seeing her students out and about because she thinks it contributes to the community feeling for which New Milford strives. For 20 years, Jen has volunteered at the library. She has been the FRIENDS secretary and currently she is the volunteer coordinator. She loves helping to run the FRIENDS Summer Book Sale. The Book Sale has grown quite a bit since 1998, when the whole sale was on the front lawn of the library – last summer it took up the entire high cafeteria! Jen is a member of the Modernization and Building Committee for NMPL and is optimistic that our library’s improvements are going to happen. We are keeping our fingers crossed! Among Jen’s favorite authors are Nelson DeMille and Janet Evanovich-and her favorite book is East of Eden by John Steinbeck. She teaches the book to her students in AP Literature. She really likes suggesting books to people-she is usually successful at matching the book to the reader! Last year, Jen received her Master’s in Educational Technology. Jen’s philosophy on life is to be generous-share your smile, your talents, and your strength with your community. We are so lucky to have Jen sharing her talents at the library in so many ways. Her dedication is awe-inspiring. When you see her around town and in the library, give her a big thanks! !